What a Bargain! / Riesenschnäppchen! Seeing a wine on a restaurant list for less than the current retail price: that truly is a rare thing. 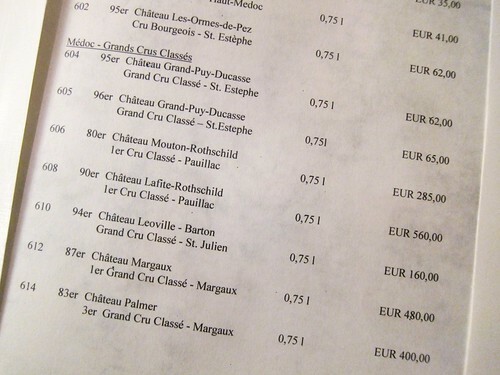 Seing a 1990 Lafite that currently sells at about 800 to 1000 Euro in German online shops at only 560 Euro on the restaurant list? Bingo! Well, I didn’t order it, still a bit out of budget but good to know right? Oh, where it was exactly? A restaurant on the German countryside – won’t tell more than that ;) !